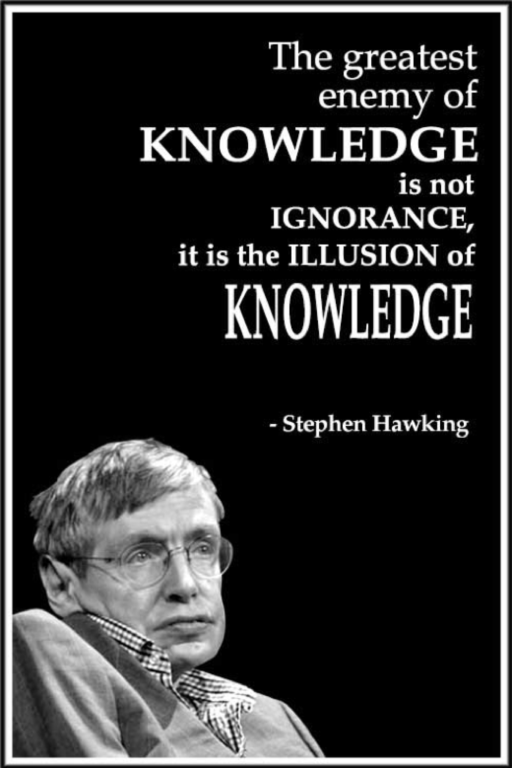 Last month the world lost a science legend with the passing of Stephen Hawking. An extraordinarily curious man, he sought answers to some of the really big questions of our time. He was obviously a brilliant thinker and reflecting on his life and accomplishments reminded me of an interesting blog I read a couple of years ago about how we, as humans, think and process or make sense of information and some of the flaws in the process. Too much information – to deal with the information overload our brain filters most information out and retains other bits that might be useful. However, this means we may be more apt to notice things that have been repeated often or are funny or bizarre, we recall and build on information we just read, and we are drawn to results or stories that confirm our existing beliefs. Not enough meaning – we take this filtered information and see patterns and fill in gaps with what we think we know to “update our mental models of the world” (1). Some ways we tend to deal with this is that we tend to see patterns where none exist, we rely on stereotypes and generalities, and we simplify mathematical probabilities to predict if something will happen. We need to act fast – it is likely a survival instinct that requires that we take new information and make quick decisions and use the new information to anticipate the future. As a result, we may choose the simple or less risky option rather than the best option. What should we remember? – There is too much information coming at us and so we must constantly make decisions about what to remember and what to let go. In the process we reinforce some memories and edit them incorrectly over time; we drop specifics and formulate generalities and whether we remember something may not be based on how important it is but rather what was going on or how we were feeling at the time. Our memory can be faulty and self-serving and can reinforce the errors in our thinking. Do read the full blog as it is full of great examples and links to descriptions of the various cognitive biases. To give you a taste, here are two biases from the Catalog of Bias that caught my eye. Hot stuff bias: “When a topic is fashionable (“hot”) investigators may be less critical in their approach to their research, and investigators and editors may not be able to resist the temptation to publish the results.” They go on to cite examples such as use of statins or HRT – I wonder if vitamin D or ketogenic diets might fit the hot stuff bias definition in the nutrition world these days. 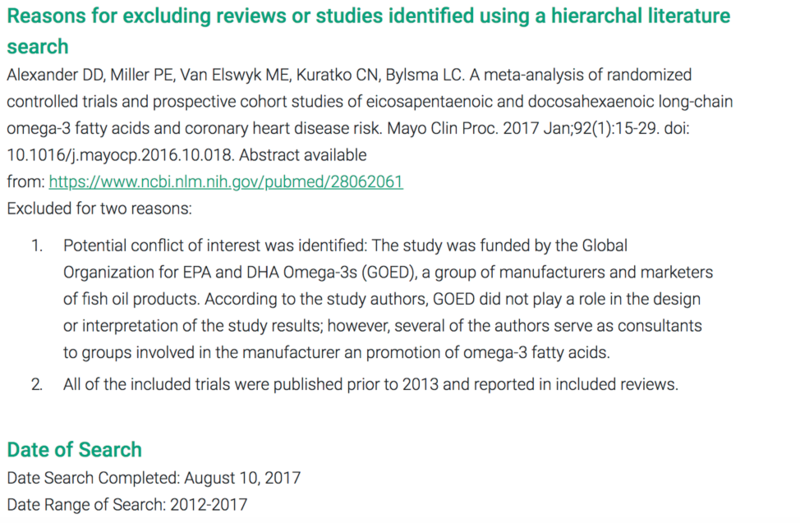 One-sided reference bias: “When authors restrict their references to only those works that support their position.” Also known as “cherry-picking” it can lead to a false sense of the body of knowledge on a particular topic and is why transparency regarding search strategies is so important. See How do I...Find Search Strategies in PEN? The issues of too much information, not enough information, our need to act fast and rely on our faulty memory will always be with us. Being aware of how we deal with these issues and finding tools and strategies to address them, can help us be better thinkers, problem-solvers and decision makers. And most importantly, thank our many PEN volunteer authors and reviewers! Sackett DL. Bias in analytical research. Chron Dis 1979;32:51-63. Available at: http://www.jameslindlibrary.org/sackett-dl-1979/ (scroll down below the first page preview to access the entire article. This March, members of the PEN Global Governance group met for their annual meeting in Monterrey Mexico. While the purpose of the meeting was to conduct strategic planning for the international PEN System for the year ahead, it was also an opportunity to meet with colleagues from Mexico who share a passion for evidence-based dietetic practice. Our hosts were Dr. Manuel Lopez Cabanillas Lomeli, Director of the Facultad de Salud Publica y Nutricion (FaSPyN) of the Univesidad Autonoma de Nuevo Leon (UANL), Dra. Elizabeth Solis Perez Director, Centro de Incubacion de Empresas y Transferencia de Tecnologia of UANL, Maria Guadalupe Solís, Presidenta de la Junta de Honor del Colegio Mexicano de Nutriólogos and Dra. Edna Judith Nava González, Profesor-Investigator in the FaSPyN at UANL and President and Council Director of the Colegio Mexicano de Nutriólogos 2017-2019. Upon arrival, the PEN Global Governance group was treated to a tour of Monterrey and a fabulous dinner featuring regional cuisine. The next day, we were welcomed to the UANL by Dr. Daniel González Spencer, Vice President of International Relations at UANL, following which, we met with about 100 faculty, staff and students from area universities and through a panel of presentations shared an international perspective of Building the Nutrition and Dietetics Profession for the Future. This was followed by an afternoon workshop demonstrating the Power of the PEN System delivered by Dr. Jayne Thirsk, Director of PEN: Practice-based Evidence in Nutrition. 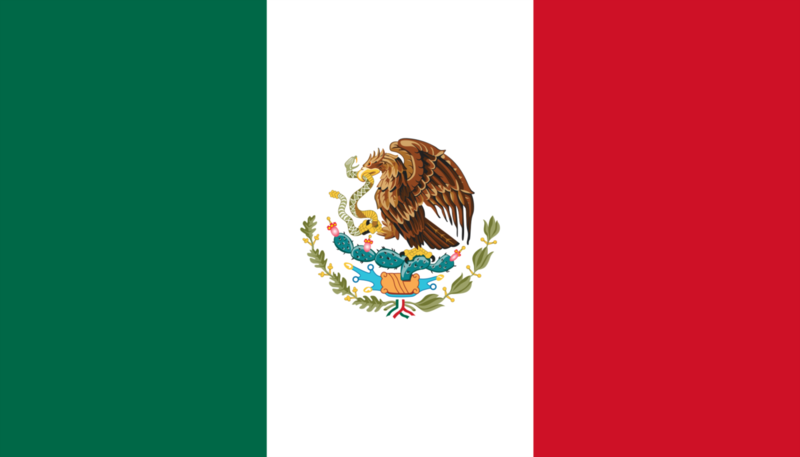 There was tremendous interest in the PEN System by those in attendance and we look forward to welcoming Colegio Mexicano de Nutriólogos and Mexican universities training dietitian/nutritionists into the PEN Community. Our hosts prepared a lovely movie of the highlights of our time together and we invite you to view it here. How do I… find Search Strategies in PEN? Do you ever read a Practice Question in PEN and wonder: What was the time period of the literature search? or Where did the author find the evidence? or Why wasn’t a specific article included? This information has always been a valuable part of our internal files. 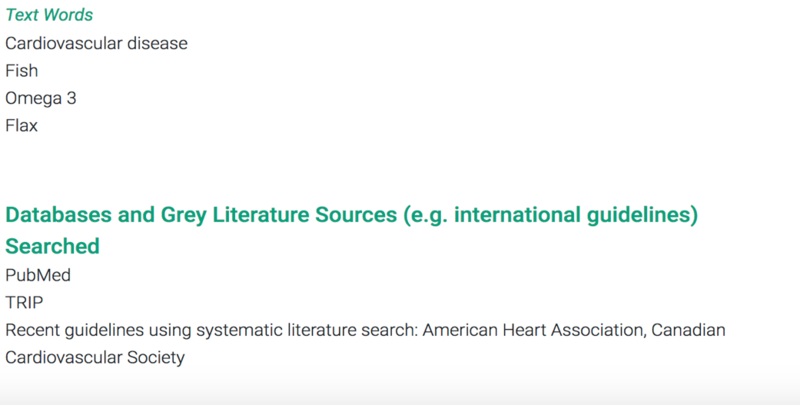 Going forward, the PEN Team is adding Search Strategies to the PEN website for new and updated Practice Questions so that PEN users can review them. You can see the link to the Search Strategy underneath some Practice Question titles now, as in the example below. In March, I was attending the British Dietetic Association’s annual conference in London, UK. With my research interest in nutrition labelling in mind, I listened to a representative of SpoonGuru address the audience of dietitians about their new app: technology which provides the consumer with a personalised list of available products based on their nutrition and health preferences. That’s it, I thought. Consumers do not need to read nutrition label information again. Nutrition information is now a familiar part of the food label. A printed collection of numbers on food packaging, there to help consumers make informed choices about the foods they buy and eat. But has this actually had an effect on health? Obesity levels are not yet significantly lower. Recent data from the UK National Diet and Nutrition Survey shows the population are still eating more sugar and saturated fat than they should (1). Yet nutrition labels have become more sophisticated, and now include additional voluntary ‘front of pack’ nutrition signposting on an increasing number of products. Legislation on mandatory nutrition labelling has evolved further still. Nutrition information is now required for products in Europe and the UK, where it was already prevalent, and modifications to the US Nutrition Facts Panel will now promote sugar and calorie content (2,3). Legislation still seems to believe in the nutrition label as a public health approach providing consumers with the means to choose a healthy diet. Yet research has shown that nutrition labels may not be equitable, with the motivated and knowledgeable ‘nutritional elite’ more likely to use them than other socio-demographics (4). It has also been shown that many types of consumers have difficulties using and interpreting complex numerical nutrition labelling (5). Consequently, nutrition labels may not be realistically useable by all consumers and therefore fail to impact on population health. Accordingly, research has struggled to find evidence of the effect of nutrition labels on consumers’ real-life food behaviours and purchases. That said, the expectation of enhanced labelling with legislation is great: with theoretical estimates on obesity reduction in Europe modelled between 2- 6.5% (6). Independent of consumer use, nutrition labels are essential in many ways to support better dietary health. 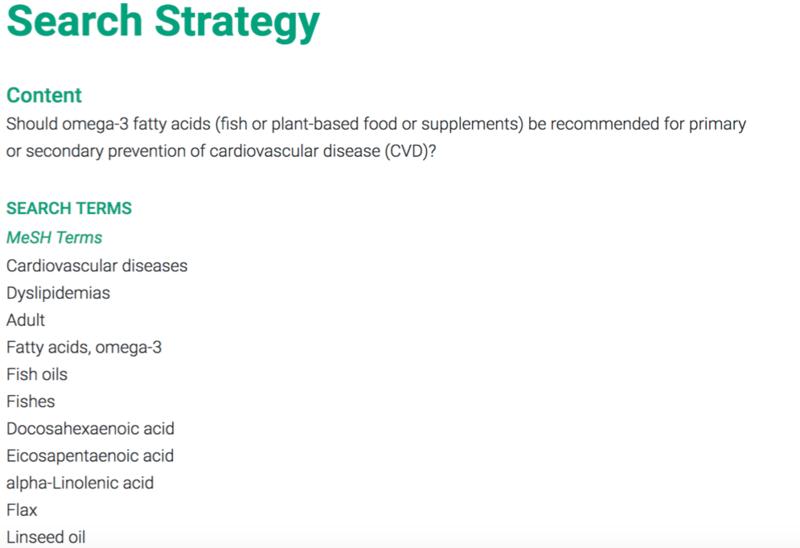 For example, nutrition information is needed by manufacturers who want to optimise specific nutrients or make health or nutrition claims about their products. Nutrition information also enables food industry recipe reformulation to change levels of key nutrients, which could result in positive changes to population nutrient intakes over time (7). Without nutrition labels, dietitians and nutritionists would not be able to compile food composition databases to undertake dietary intake assessment. Perhaps we need to change our approach to nutrition labels and how they can improve dietary health. Advances in technology, including personalised ‘nutrition’ apps, can now be considered together with the research findings concerning how consumers really use nutrition label information in real-life. See PEN Food and Nutrition Labelling Knowledge Pathway for more on the growing research evidence base. Beyond the emphasis on legislation to drive the use of the nutrition information on the food label, it might just be time to rethink exactly how we, as dietitians, promote use of the nutrition information when aiming to improve our population’s dietary health. Butriss J L. The role of nutritional labelling and signposting from a European perspective. Proceedings of the Nutrition Society. Conference on ‘Improving nutrition in metropolitan areas’ Symposium 5: The role of regulation to improve nutrition. 2018. P1. Since it first opened its “doors” ten years ago, the EatRight Ontario (ERO) Dietitian Contact Centre has provided outstanding direct service to the public living in the province of Ontario, Canada, as well as support to health intermediaries providing nutrition services. The contact centre was established to provide expanded access to the trusted advice from dietitians. Using a special version of the PEN database (contact centre PEN or ccPEN) they provided evidence-based nutrition advice to literally millions of consumers and health intermediaries via phone, email or on their award-winning website. The ERO team produced hundreds of practical tools to help translate the science of nutrition into actionable steps to promote healthier eating. The PEN database is proud to host many of these outstanding resources and to make them available to PEN users. We congratulate all our colleagues at EatRight Ontario for a job well done. Sadly, the government funding to support ERO has been directed elsewhere. We’ll miss you! Take a moment to review their achievements in this EatRight Ontario Legacy Report. Dietitians of Canada has heard from dietitians, health care professionals and the public that they value the consumer friendly, evidence-based content on the award-winning EatRightOntario website. Dietitians of Canada is pleased to be expanding this website under the new name of UnlockFood.ca. UnlockFood.ca will continue to be based on PEN evidence and help our audiences understand who dietitians are, what they do and why they matter. In addition to maintaining the nutrition and healthy eating content, the site will help the public to find a dietitian and understand how dietitians make a difference. "PEN® Trending Topics respond to media questions"
Looking for a response for a hot topic, news-making evidence or the latest nutrition-related media story…. PEN® responds with Trending Topics. It’s impossible to keep up with all of the nutrition-related stories in the news – even for PEN. PEN® team members scan the media for what’s hot and what’s not and we provide responses to those stories we think have an international interest for our international PEN® users and social media followers. In particular, topics which may have an impact on practice are chosen to provide an evidence-based response or opinion. There are in depth reviews of topics, shorter analyses of scientific papers and other information pieces in the Trending Topics family. Plant-Based Beverages – Are They Really Healthier for Young Children? Lectins – Are They Damaging To Our Health? Does A2 Milk Have Health Benefits? 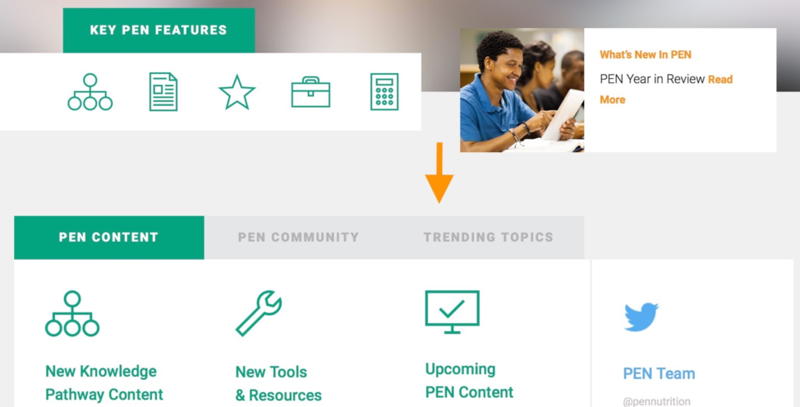 Add Trending Topics to your monthly PEN® Alerts – in an article in PEN eNews last year we described how to sign-up for Alerts to new PEN® content directly into your Inbox. "Being a PEN® reviewier contributes to my professional portfolio"
Dietitians around the world have similar practice-based questions and face similar challenges in trying to stay on top of emerging evidence and nutrition research. Peer review is an integral part of the PEN® content development processes. Peer review ensures that we are asking the right practice questions, and that the research is effectively translated into actionable and practical guidance. During question identification for new content and during the question verification stage of updating existing content peer reviewers from the three PEN partners – BDA, DAA and DC are invited to comment. During the review stage of PEN® content development including our practice questions, backgrounds and Trending Topics. When practice questions are developed, we try to involve both academic experts and practitioners who will be using the information. PEN aims to address real issues faced in actual dietetic practice. Is the content comprehensive? Are any key issues missing in the response to the question? Are there any key references missing? Are the references included objective, current and inclusive? 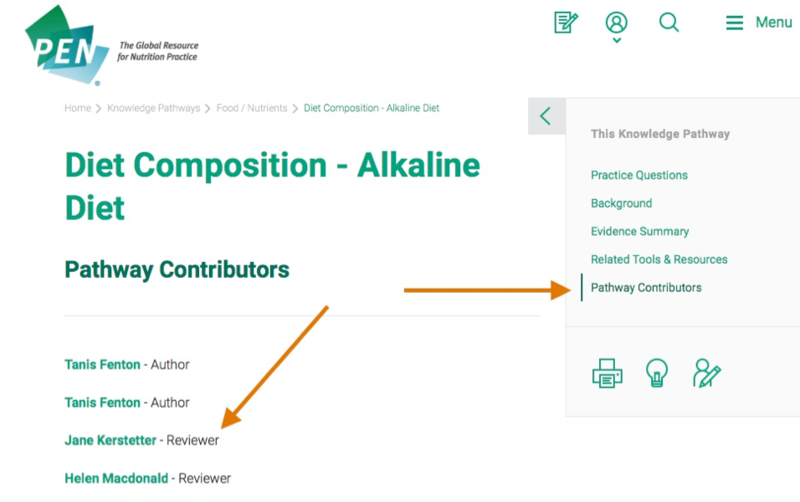 Reviewers who have agreed to be listed as a reviewer in the PEN® System are recognized as peer reviewers in each practice question under the link: Pathway Contributors section of each knowledge pathway. PEN also recognizes peer reviewers in PEN eNews when we thank our international volunteers for their peer review contributions to the PEN® content development process. 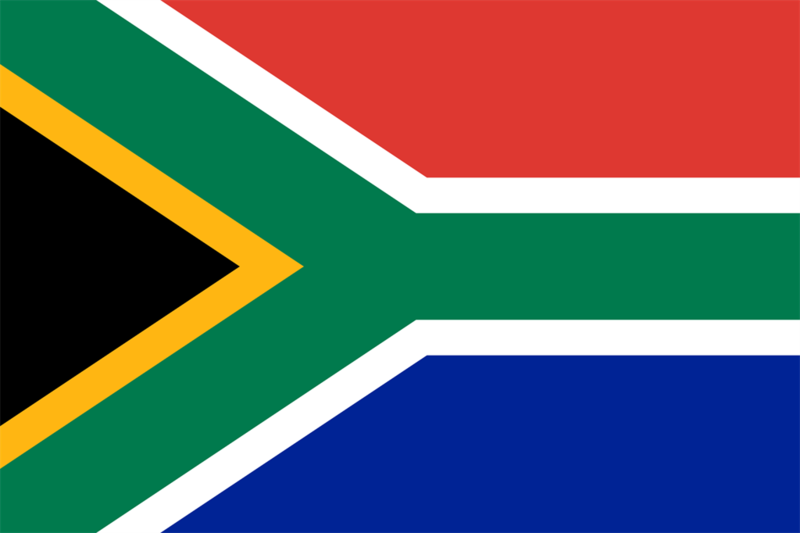 In the PEN Content Management System (PCMS) reviewers receive a thank you letter for their contribution and they can obtain a letter of contribution to PEN over a period of time that they define. This letter can then be used to add to your professional, continuing education portfolio as most regulatory bodies recognize reviewer’s contributors to PEN. In addition to contributing to the PEN® System, peer review helps to expand our current knowledge, writing skills and encourages self-reflection of our own biases and assumptions. Our global PEN® partnership has benefited from volunteer efforts around the world. Please take a moment to read and acknowledge your colleagues who have served as authors, or peer reviewers for PEN content since April 2017. "Guaranteed to be a great learning and networking experience"
In the last issue of PEN eNews, we shared details of the upcoming Dietitians Association of Australia (DAA) National Conference, 17-19 May 2018! The theme is ‘Think Big’ and PEN, as an innovative knowledge translation tool, is a perfect fit within this theme – featuring a number of times in the program. We’re thrilled to be holding two PEN-specific workshops co-ordinated by DAA’s PEN Translational Research Leader, Associate Professor Judy Bauer (FDAA) along with other key members. Evidence-based practice: Introduction to the GRADE system of evaluating evidence: Friday 18 May 2018 (A/Prof Judy Bauer, Dr Vasant Hirani and Juliana Chen (PhD Scholar), University of Sydney). PEN has committed to using the GRADE approach and this workshop is designed for dietitians and students wanting to learn more about the GRADE system of evidence analysis and its application to dietetics practice. PEN, the global resource for Evidence Based Nutrition Practice – 10 Tips and tools to Power your Practice: Saturday 19 May 2018 (A/Prof Judy Bauer, Natalie Stapleton DAA) PEN is such a versatile tool that can be used across many practice areas, and this workshop will provide dietitians and students with an insight into how to use PEN and how it can be benefit their practice. Also, at the conference, the 2017 PEN Prize Winner will be presented as part of the awards sessions. Keep an eye on future editions to find out more about this well deserving recipient! The PEN Australia team will be attending the Sydney conference and speaking with delegates about PEN and its features. If you’re attending please come along and say hello to the PEN Australia team at the DAA stand in the trade exhibition area. For further information on the 35th DAA National Conference or to register, visit daa2018.com.au. "The PEN team will be by the Registration desk"
Hosted in beautiful Vancouver British Columbia, the DC National Conference aims to help you Elevate your practice, learn how to effectively Influence others, and Inspire you to grow and thrive in your profession. The conference offers 3 days of workshops, lectures, and tours sure to interest dietitian-nutritionists in all areas of practice. With over 30 concurrent sessions, 6 local tours, a variety of plenary lectures and symposia, the Conference and offers diverse learning opportunities from esteemed subject matter experts from across North America (and Australia!) speaking on topics covering the art and the science of dietetics. Special programming is offered this year for students or those in the first 3 years of practice. In addition, many specialty practice area Networks will be hosting evening social events, providing you the opportunity to meet and connect with colleagues interested in your areas of practice. Of course, the PEN team will be there hosting a booth and a session: Hot topics in everyday practice. Join our three speakers who will provide a succinct summary of the issue, the evidence, the hype and the practice recommendations related to leaky gut, nutritional genomics and genetically modified foods. We’ll also announce this year’s PEN Achiever Award winner! Early Bird Registration Deadline: April 23, 2018.